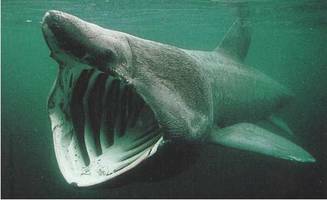 1 Basking sharks are not typical sharks. They are quite harmless. And they are very laid back. Their favorite activity is to swim very slowly near the surface "to sunbathe." Sunbathe? Well, that is not entirely true. But when they move about like that, only the tips of their snouts, dorsal fins, and tails poke above the water. Looking from afar, it does appear that they are relaxing under the sun and trying to tan themselves. This interesting habit is why we also call them sunfish. 2 If basking sharks don't swim near the surface for sunbathing, what are they doing there? 3 The answer is eating.